The Fourth Doctors first battle with his archenemies. Genesis of the Daleks also marked the introduction of their creator Davros who would go on to be a staple of Classic era Dalek stories from this point on. Long regarded as one of the greatest Doctor Who stories ever made. Genesis of the Daleks has been repeated many times since its transmission and earned a place in popular culture like few other stories. The Doctor, Sarah and Harry are abducted by the Time Lords whilst trying to return to the Nerva Beacon. A Time Lord agent tells the Doctor that they have been taken to Skaro the home planet of the Daleks. Apparently at some point in the future the Daleks will destroy all other life forms in creation, having risen to a level of power where not even the Time Lords can stand against them. The Time Lords tell the Doctor that he must do one of the following. Erase them from history altogether. Change their development so that they become less aggressive creatures. Or slow down their development at least so that other races are given enough time to catch up to them. The Doctor agrees to do this mission for the Time Lords and the agent before departing, hands him a Time Ring which will allow him to reunite with the TARDIS once the mission is over. The Doctor, Sarah and Harry discover that they have been teleported in the middle of a war zone. With the soldiers using a mix mash of weaponry from different times. Along the way the Doctor and Harry are separated from Sarah in a gas attack. The Doctor and Harry are able to make their way to a city, where they encounter the native humanoid life forms, the Kaleds. The Kaleds reveal the history of Skaro at this point to the Doctor. A war has been raging between two humanoid civilisations, the Kaleds and the Thals for 1000 years. All cities and civilisations have been destroyed except for one from each race. The use of nuclear and atomic weapons has slowly over the centuries destroyed the surface of Skaro, turning it into an irradiated wasteland. Both the Kaleds and the Thals have begun to slowly mutate. Whilst the mutants, disparagingly referred to as Mutos are cast out into the wilderness to die. More and more Mutos are born every generation on both sides. Davros meanwhile a crippled and brilliant scientist is the head of the Kaled scientific elite. The Doctor and Harry are taken to the Kaled bunker, whilst Sarah is abducted by a group of Mutos. The Mutos want to kill Sarah, but one of them named Sevrin saves her. Sadly however Sarah and Sevrin are later captured by the Thals who force them to work on their rocket. The Thals are building a rocket to launch at the Kaled city which they believe will finally exterminate their enemies. Meanwhile in the Kaled bunker, the Doctor discovers that Davros is creating something far worse. Davros has discovered that the Kaleds are all destined to mutate more and more over the next few generations. Davros is eager to find out what their final mutated form will be, and so he has taken living Kaled cells and subjected them to the same radiation that is polluting the air of skaro. Davros has discovered that the Kaleds are destined to mutate into a hideous, amorphous blob like creature. After creating several of these Kaled mutants, Davros creates robotic casings to house them. However he also tampers with the Kaled mutants minds. He removes all emotions that he considers weak such as love, compassion and pity from their minds, but and programmes a strong aggression towards all life forms that are different to them as well. Davros believes that one race must dominate the others in order to survive, and so he wants to make sure that this new race of Kaleds will treat all other life forms as their enemies. Davros christens his new creation a Dalek. Several of the Kaled scientists who are working on the project grow scared that what Davros is creating is evil. One of these scientists named Ronson, helps the Doctor and Harry to escape to the city of the Kaleds to warn them about what Davros is creating. The Kaled government tells Davros that they will investigate and though Davros agrees, he decides to betray them to the Thals, declaring that they have signed the death warrant for the whole Kaled people. Davros gives the Thals the secrets they need to breach the Kaleds protective dome. Despite the power of the Thals rocket, it will not even scratch the dome and so Davros gives them a chemical that will dissolve it. That Thals are initially quite skeptical as to why Davros is helping them to exterminate his own people, but Davros, and his vile assistant Nyder claim that they want this war to end. The Doctor and Harry meanwhile who had arrived in the Thal city to try and help Sarah, overhear Davros’ plans. The Doctor tries to sabotage the rocket, whilst Sarah and Harry try to make their way back to the city and warn the Kaleds. Sadly however they all fail and the Thals exterminate the Kaled city. Davros subsequently frames Ronson for betraying the Kaleds to the Thals and has the Daleks exterminate him. Davros then sends a squad of Daleks to the Thal city where they begin exterminating them. The Doctor is able to help a few Thals escape and tells them to work with the Mutos as its their only chance. Most of the Thals are exterminated by the Daleks in the city. The Doctor, Sarah and Harry are then captured by Davros and Nyder when they try to re-enter the bunker. Davros, having read Ronson’s interrogation, learns that the Doctor is from the future. The Doctor pleads with Davros to stop the development of the Daleks by telling him of the horrors his creations will commit. When the Doctor lets it slip that the monsters will lose in the future, Davros demands to know how and proceeds to torture Sarah and Harry to make him talk. Meanwhile in the Kaled bunker more scientists begin to question Davros, including Gharman. They attempt to organise a rebellion against Davros, and the Doctor at one point is able to wire the Daleks incubation chamber up to explosives. He sadly however gives up a golden opportunity to exterminate the monsters. He wonders if he has the right to kill them, and that if perhaps, for all their evil some things might be better with them, as various races will unite in mutual fear of them. Sadly Gharman’s rebellion is crush by the Daleks. Davros only allowed it to carry on to discover which of the Kaled scientists were truly loyal to him. The Doctor however working with the Thals and Muto survivors is able to blow up the corridor leading to the Kaled bunker, and the Daleks and Davros are sealed in under thousands of tons of rubble. The Doctor says that it will take them thousands of years to escape, and to recover the work that has been destroyed. This will be enough to prevent the Time Lords vision of the future from coming to pass by giving other races enough time to catch up to them. Trapped in the bunker together, the Daleks soon turn on Davros and begin exterminating the Kaled scientists who remained loyal to him, including Nyder. 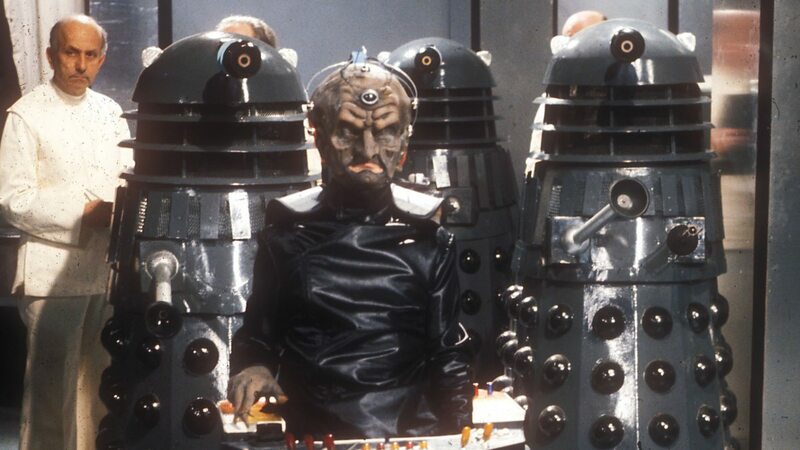 Davros pleads with the Daleks, but they refuse to listen declaring themselves to be the masters. Davros realises the horror of what he has created just as the creatures turn on and exterminate him too. The leader of the Daleks then declares that though they have been entombed, they will eventually escape and take their rightful place as the supreme power of the universe. As the Thals and Mutos leave together, the Doctor, Sarah and Harry leave Skaro using the time ring. As they vanish through the vortex the Doctor is confident that they have done the right thing. Genesis of the Daleks is one of the most highly regarded Doctor Who stories and its not hard to see why. Its not perfect of course, as no story is. There are some moments where the production values let it down such as the giant clam scene, but overall Genesis much like the first Dalek story, is an exciting, action packed boys own adventure on the surface, with a lot of depth underneath. Genesis returns the Daleks to being frightening allegories for the Nazis, as well as fascism and racism in general. The few stories before Genesis like Death to the Daleks and Day of the Daleks, though having done some interesting things with the monsters, had still in some ways reduced the Daleks to being more generic invaders. With Genesis however the monsters are finally given a fuhrer figure in Davros. Genesis shows us how evil, twisted men like Davros are able to seize power not just through their own cunning and guile, but rather through the inaction of those around them. The Kaleds have so many golden opportunity’s to stop Davros but they never take them. The Kaled government give him time to plot against them when they should have just shut the bunker down right away, whilst Gharman and the other rebellious Kaled scientists similarly rather than just imprison Davros, play right into his hands and decide to hold a vote to see who should lead them. No one except for the Doctor is aware of just what Davros is capable of until its too late. At the same time we also see how Davros is able to play on other people’s weaknesses to his own advantage to such as the Thals who as he puts it, are so hungry for victory that they don’t care how untrustworthy Davros obviously is. Davros can not only spot the weaknesses in others, but there is also no low that he won’t sink to either and that’s the real reason he wins. His enemies are simply not as dirty and underhanded as he is. They are reasonable, which is something he sees as cowardice. Everything about Davros is perfect for this story. His characterisation is both complex and frightening. To start with it merely appears that Davros is doing all he can to ensure the survival of his people, the Kaleds. However it soon becomes obvious that he is actually intending to reshape his entire race in his own image. Davros ironically despite being unable to even defend himself, despises those he considers weak, which includes even his own people the Kaleds. The Daleks are what Davros likes to think he is. Strong, ruthless, and never willing to compromise like the supposed weak and pitiful Kaleds, such as Gharman who he derides as “someone who’ll listen to a thousand view points and try and satisfy them all.” Or even the Doctor who Davros sneers at for having compassion for his friends which he exploits when torturing them. Its a brilliant irony at the end of the story when Davros discovers that as wretched, selfish and ruthless as he is, ironically even he is capable of some compassion and mercy after all. When the Daleks who are completely devoid of any pity turn on his most loyal followers, Davros ends up pleading with them, just as the Doctor did for Sarah and Harry’s lives earlier. Davros learns in this moment that compassion isn’t a weakness, as ironically the Daleks are slaughtering people who could help them, even their own creator, because they are incapable of anything else. Davros finally realises just what a monster he has created in his final moments. Nothing has ever existed like the Daleks before. Even the most evil person like Davros can still show mercy to people who are loyal to him. In this respect I can understand why some fans and critics were annoyed at Davros being brought back. His ending here is just so perfect, when he finally realises that his creations are evil, and actually tries to destroy them himself. Also I love the way the Daleks make no big deal of killing Davros, their creator, as they see him in exactly the same way as they would a lowly Thal soldier. Both of them are just other life forms and therefore the enemy. Furthermore there is also a fantastic irony the way that Davros is forgotten. The Doctor despite being the archenemy of the Daleks had never even heard of him. The Daleks were obviously intended by Davros as being a way for him to live forever. Monsters created in his image who would terrorise the cosmos and make his name one that people would curse and fear for all eternity. However ironically he won’t even be a footnote in the history of the universe as previous Dalek stories showed. The Daleks themselves will make sure no one remembers him as they don’t want people to know that they were created by a lesser creature. Sadly later Dalek stories will undo all of this and simply have Davros going back to try and rule the Daleks, completely ignoring his development at the end of this story. I do love the later Davros stories, and I think the writers did a good job in developing him from there, but I am at least sympathetic to the “Davros should never have been brought back” argument as his ending is just so stunning in Genesis. In fact its my favourite moment in any story. Another reason Davros is so spectacular in this story is Michael Wishers performance, which is easily among the top 5 in the entire history of Doctor Who. Wisher captures all of the fanatical, bitter qualities of the villain, as well as his craven cowardice too such as in his final moments with the Daleks. There are moments where Wisher is eerily calm such as when he disturbingly talks of dissecting Gharman’s brain, then there are the moments where he screams so hysterically he almost sounds like one of his creations, such as during his brutal torture of Sarah and Harry. All the other actors who would go on to play Davros after such as Terry Molloy and Julian Bleach would attempt to emulate this aspect of Wishers performance, and whilst they were both very good, I don’t think anyone ever managed it as well as Michael. Some fans and critics have argued that Davros’ appearance here negatively impacts the Daleks who are pushed to the background. Personally however, whilst this does happen in later Davros stories, I definitely don’t think that’s the case in Genesis. To start with we are taken to the very depths of the Daleks evil in this adventure to a far greater extent. Here we see how even the most evil humanoid like Davros, a man who has carried out a double genocide is shocked at how ruthless they can be. Also something which is often overlooked in reviews of this story is how formidable the monsters are too. A mere 20 Daleks exterminate an entire city of Thals with no effort whatsoever. Director David Maloney also shoots them in such a way where they seem large and foreboding, such as when the Thals and Mutos cower in the Trenches as they slowly glide by. The Dalek voices in this story are my favourites as well. Roy Skelton, by this stage a long standing Dalek voice veteran gives them the perfect, screeching , rasping voices. Far from seeming like nothing compared to Davros, at the end when the Daleks make him beg for the lives of his scientists and exterminate him, they’ve never seemed more evil and powerful. I love the Daleks final speech. Roy Skelton’s delivery is absolutely perfect as the Dalek’s leader spews its hatred and anger towards the rest of the universe. This story also elevates the Daleks to being a threat to the Time Lords too. Though the Time Lords had sent the Doctor on a mission to deal with them before in Frontier in Space, here its different. In Genesis the Time Lords are absolutely terrified of the Daleks after having seen a future where they are able to triumph over the Time Lords. They are actually willing to break their most important law and change all of history to stop the Daleks! Understandably some people felt that this story contradicted the first Dalek story which gave a brief overview of the Daleks origins that were different to this story. Personally however I don’t see it as that big a contradiction as after all in the Daleks, all we had were a few scant historical records, where as Genesis gives us a first hand account. Furthermore Genesis also explains why the Daleks behave the way have done in every previous story to this brilliantly. Prior to this adventure every single Dalek that we had ever seen acted in exactly the same way. From the lowliest drone to the Emperor, they were all devoted to their cause of exterminating all other life forms in the universe. There were no Daleks who were merciful, but there were also no Daleks that even had ambitions and desires of their own. They all thought exactly the same, despite being organic life forms. Here however we find out why. Davros had conditioned their minds to all think exactly the same, and all be devoted to exterminating other life forms. This revelation not only explains why the act the way they do, but it opens up a whole new aspect to the Daleks personalities. Now we know there can never be a good Dalek. Before we had just assumed that the Daleks all think the way they do because they come from a war like culture, like say the Klingons in Star Trek. Here however we see that they are all conditioned to be ruthless, and can never change how they are. Whilst it makes them far more terrifying, it also makes them somewhat more sympathetic ironically. The Daleks unlike say the Master, or even the Cybermen who willingly chose to convert themselves, have never had a choice in what they were. They did once, when they were Kaleds, but sadly Davros took that from them and has trapped them in this hideous state forever. There will never be a Dalek that thinks what they are doing is evil and tries to free the rest of its people, and worse they will never stop trying to conquer as they literally have no other desires or feelings, other than a lust for conquest. Genesis really is what establishes the Daleks as the Doctors most dangerous and evil adversaries more than any other story, as it shows them not only becoming the biggest threat to the Time Lords (as well as the rest of the universe in the future), but also finally establishes once and for all that the Daleks can never be anything but evil conquerors. Aside from Michael Wisher the other stand out performance in this story is Tom Baker. Its a very subdued, and thoughtful performance. That’s not to say that there aren’t moments of Tom’s brilliant trademark humour, such as when he clobbers the two Thal guards, but for the most part his Doctor is a man with a very heavy burden. Its not just as simple as blowing up the Daleks this time. The Doctor will be wiping them from history and so he has to actually think about what that means. Not only will he be committing genocide, but who knows what might change by erasing the Daleks? For all the Doctor knows without the Daleks planets like say the Earth and Draconia may wipe each other out in a war, where as thanks to the Daleks they become united against them. Similarly perhaps the challenge of the Daleks will cause certain species to up their game and make great advances which benefit them in all kinds of ways, which they wouldn’t have done otherwise. Its a brilliant twist in that to start with it seems like a more straight forward adventure of “destroy the evil Daleks and save the universe”, but ultimately when its crunch time, the Doctor discovers that there are no easy ways out of this situation, and the story doesn’t necessarily say that he has done the right thing either. Sarah even says that she believes they have failed at the end. Furthermore later stories will show the Doctor still struggle with the decision, and indeed over 40 years later, fans on message boards, and in reviews are still torn over whether or not the Doctor should have destroyed them. It shows you how Nation could inject nuance into his scripts, as even when dealing with whether or not the Doctor should destroy the Daleks, his archenemies and the most dangerous creatures in the universe. He was still able to raise points, and show different sides to the dilemma to an extent that it’s still kept people talking decades on. The Doctor’s interactions with Davros are also brilliant too. I love the way the Doctor is able to see exactly the type of person Davros is. Davros claims that the Daleks will be a power for good, as when they rule over all other life forms they will do so benevolently. The Doctor however can see that a weak, pathetic little man like Davros just wants to use the monsters to tear everything down because it makes him feel strong. Really there is very little to fault with Genesis. Again other than a few production gaffe’s everything about the adventure works. It has brilliant performances, its wonderfully directed, its well paced. Even at 6 episodes it doesn’t drag, and contains some of the best cliffhangers in the shows history, such as Davros’ torture of Sarah and Harry, and the Dalek mutant choking the 4th Doctor. Overall Genesis is not only a fantastic Doctor Who story, but one of the best pieces of British television ever made. This was the last Dalek story for 4 years. Though their return in Day of the Daleks had led to a mini revival in Dalekmania (which was still going strong during this story) and all of their subsequent appearances had been big ratings hits. Script editor Robert Holmes hated the Daleks and decided to retire them after this adventure. Fans and viewers apparently sent complaints to the BBC next year as they had gotten used to having a Dalek story every year. Terry Nation who wrote this adventure said it was his favourite out of all the stories he wrote for the series. David Tennant has named this as his favourite story, and the story that made him a Doctor Who fan. Philip Hinchcliff and Terrance Dicks said that very little was changed from Terry Nation’s first draft for this story, which was unusual. Though some scenes from Nation’s original script were edited due to budget reasons (such as the Time Lord meeting the Doctor in a garden on Gallifrey.) Ultimately it remained mostly true to Nations original script. Hinchliff later joked that Terry’s first drafts were often his final drafts as they rarely needed to work on them. This story follows on directly from the Sontaran Experiment (which followed on from the Ark in Space) and leads directly on to Revenge of the Cybermen, which in turn leads directly on to Terror of the Zygons. This story is so loved by so many, with good reason. One really impressive thing about this story is how it develops and examines the Daleks’ personality, when on first glance they seem pretty one-dimensional. I always remember Verity Lambert’s passionate defence of the Daleks in An Adventure in Space and Time whenever anyone says they are one dimensional.